I never made lasagna before this summer. I realize that, for many, it’s a go-to dish, a one stop shop to satiate hunger and a craving for yumminess. But having never made it (I know–crazy), I didn’t understand how simple it could be, and how much room for creativity there is. So far this summer I’ve made three lasagnas. 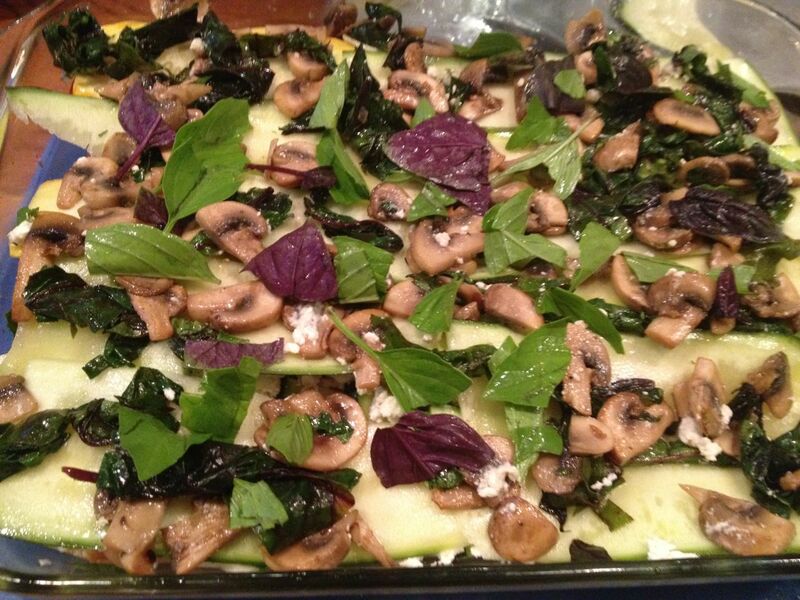 The first used a recipe from greenkitchenstories.com, a vegetable lasagna. It turned out delicious, not so gooey, and maybe not saucy enough. I realized I like my lasagnas really saucy. If there’s lots, you can mop it up with some good bread. 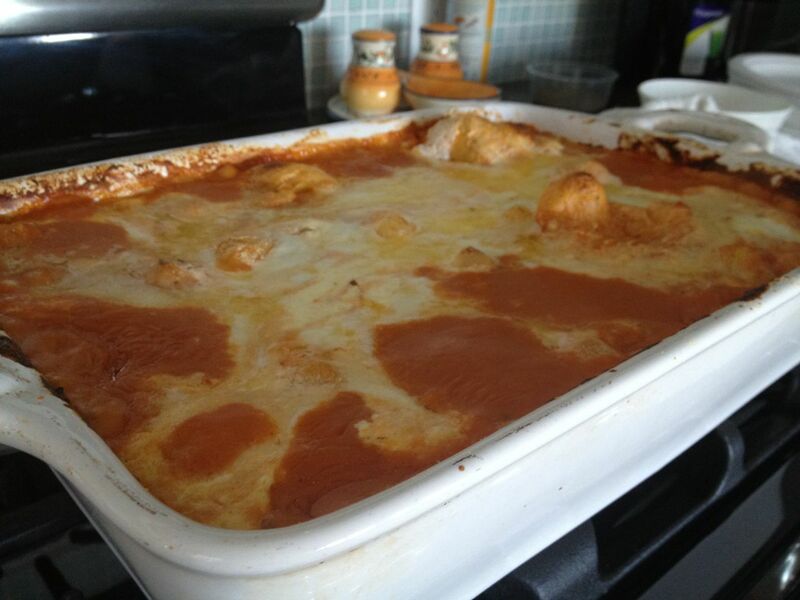 Last week, I decided to have a go at making my own lasagna sheets, my own meatballs, and of course, my own tomato sauce, thus the lasagna was, tada!– entirely homemade. Though this time I did not make my own ricotta, or other cheeses. Making pasta is easy. Find someone to teach you how to do it once, and you are golden. It is about learning how to feel and look for the right egg to flour ratio (I was taught 1 egg per 100 grams of flour, which is about one portion of pasta). The you must know how to keep the dough from sticking, how to handle it so you don’t break or stretch it, and how to not let it dry out and start to crack. I watched a very kind and willing-to-teach chef do it once, and I now feel completely competent to do it on my own! This winter or fall I plan on making lots of pasta, dehydrating it, and using homemade pasta all year long. I think it could make a cool gift, too. This was based loosely on a Giada de Laurentiis recipe, minus the spinach. Also, the meatballs were made from ground bacon from the Native Earth Teaching farm on Martha’s Vineyard, and chicken from the Good Farm, also on Martha’s Vineyard. Both farms are close to me and I would soooo much prefer to shop there than at the grocery store. They have great, fresh products, and the people are nice and fun to talk to. 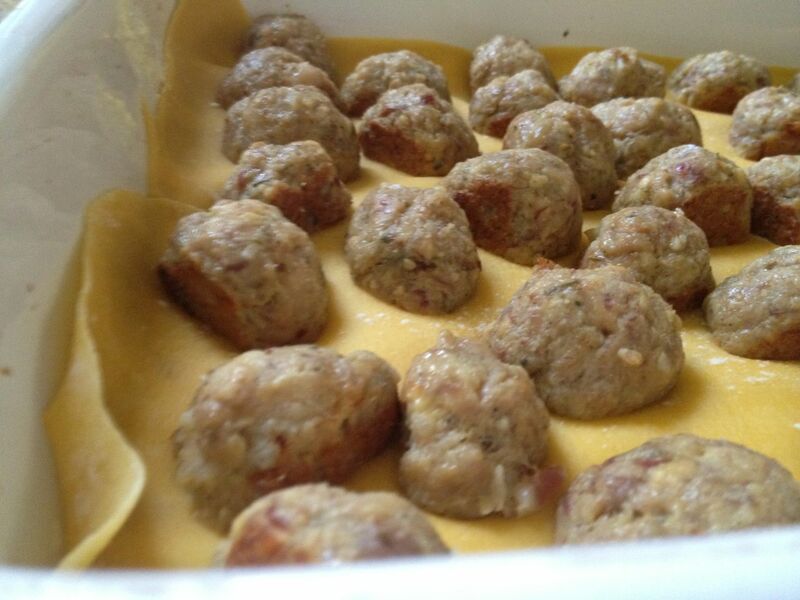 So, back to the meatballs. I used my food processor to grind up chicken leg meat (fattier than breast so better for meatballs) and the bacon. Next time I would use slab bacon, with more fat on it, if I could find it. I mixed in an egg, breadcrumbs, garlic and italian seasonings (thyme, marjoram, oregano, rosemary). I baked them in the oven a day in advance. The sauce and pasta dough were also made a day in advance. Giada called for 1.5 lbs of ricotta cheese, of which I only used, probably, a third, and that was seriously enough. With all the béchamel and other cheeses, this lasagna was definitely nice and saucy. Because I had all that leftover ricotta, I made another lasagna! This time, no noodles necessary. My friend gave me GIANT squash and zucchini from his garden, which served as the pasta in this dish. The key is, you must season all the vegetables separately to bring out their flavor. 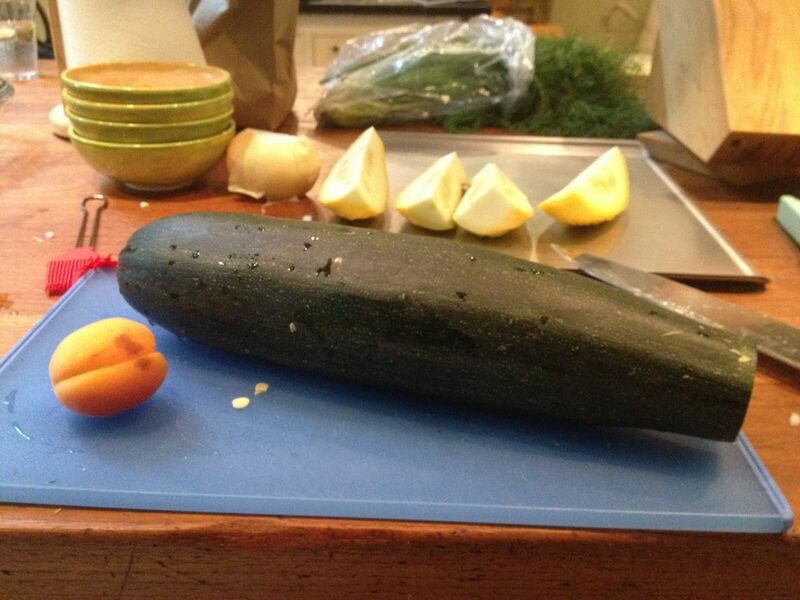 I brushed the squash/zucchini with olive oil and sprinkled with salt and pepper. I salted all the sliced tomatoes, and when sautéing the mushrooms, onions and beet greens, those got salt and pepper, too. When cooking at 375, covered for 30 minutes and uncovered for 15, the liquids of the veggies really came out and did not totally evaporate. I had some great ciabatta bread lying around so I sliced it and stuck the pieces around the periphery of the lasagna in the last 15 minutes of cooking to absorb some of the liquid. 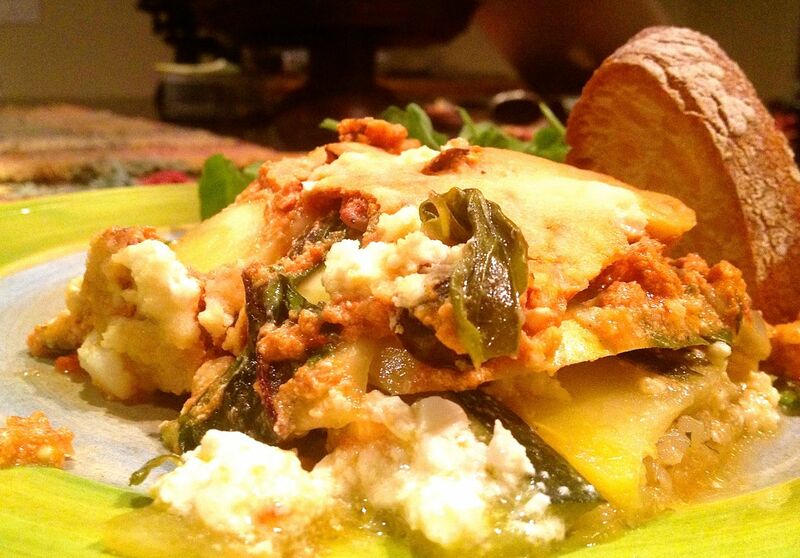 This made for DELICIOUS munching with the lasagna–half crusty and half soaked with tasty juices. Ugh. 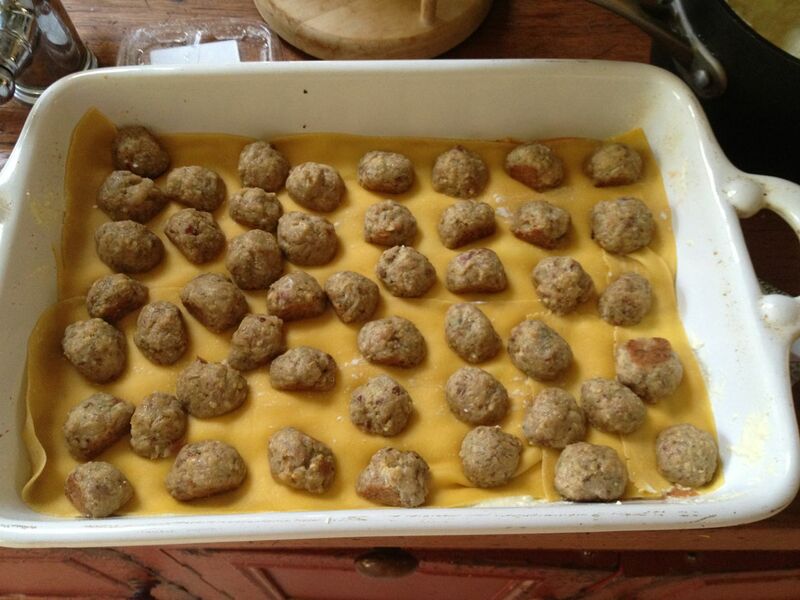 I don’t think this photo or the lighting does the lasagna justice. It was great, filling (especially with the bread), and not gooey or sticky. I would try it with mozzarella next time, too, and maybe even more tomato sauce. I ended up sharing both lasagnas with friends and family. The good thing is, they can sit in the fridge for a couple days and still taste great, so no worries about having leftovers. 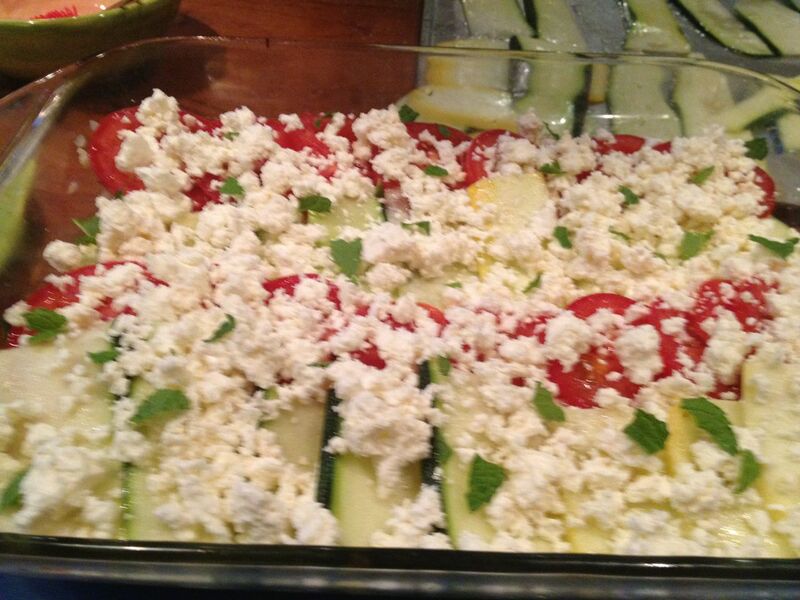 * my layers went something like this: Tomato sauce/ ricotta mixture on the bottom; zucchini noodles; onion layer; tomato layer; feta cheese; zucchini layer; ricotta/tomato sauce; mushroom and greens; zucchini; ricotta/tomato sauce; feta; parmesan.